Flip through the brochure from your local recreation center, and you're likely to find qigong classes listed. But what is qigong and what does it do for you? Qigong (pronounced "chee gung") is a holistic system developed in China that encompasses training for the body, mind, and spirit. It is an ancient discipline--archeological evidence shows that it was practiced as early as 5,000 years ago in China. Over the centuries, it has been modified and refined to suit changing times and knowledge. One way to describe qigong is to say that it is the practice of moving energy (called "qi") through the body in specific ways. Qigong practitioners say: "Where qi flows, disease disappears." With regular qigong practice, stress, high blood pressure, joint and muscle pain, and a host of other physical and psychological symptoms of distress and imbalance vanish away. In China, thousands of replicated research projects have conclusively demonstrated these effects and more. In the West, contemporary experiments are now showing the same results. You might think that something this effective would be very hard to do--visions of pretzel-shaped legs and Shiva-like arms may be dancing in your inner eye. But the opposite is true. Qigong is easier to practice than yoga, for example, and can be modified for people who are very young, aging, bedridden, or wheelchair-bound. What all forms of qigong all have in common is that their healing methods are based on a sophisticated understanding of the energetic nature of the human body. In Traditional Chinese Medicine, each organ is associated with a network of channels that carry qi throughout the body. These networks both support and restrain one another in predictable ways; it's when the system gets out of balance that disease and distress arise. The healing power of qigong lies in its ability to restore the energetic balance of the organ networks. This bolsters the immune system and improves the body's ability to fight off all sorts of disease, from colds to cancer. Qigong can alleviate a wide variety of chronic conditions: migraine sufferers, for example, may find their headaches lessen in severity; those with arthritis discover that their aches and pains ebb with qigong practice; people with hypo- or hyper-thyroidism may experience improved glandular function. Qigong is also effective at addressing persistent emotional states. A chronically angry person might find that the anger switch doesn't get tripped as easily. Those with a tendency toward overthinking may experience a greater ability to quiet their mind. A person who walks around with a cloud of sadness may find that they're laughing more. This rebalancing of emotions can reduce stress levels markedly. Qigong practices vary widely--there are more than 3,000 different types of qigong in China. But there are three major branches of the energetic arts in China--the Shaolin, Wudang Gongfu, and Emei--and the intention behind the practice differs between them. 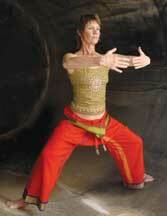 Many qigong forms taught in North America focus solely on the body and physical health. Emei Qigong takes a more comprehensive approach, and students enjoy healing benefits not just in the physical realm but also in the emotional and spiritual realms. Another distinctive characteristic is that Emei Qigong places an emphasis on learning theory. This allows the student to marry mind intention with action, which amplifies the effect of the practice. Emei also enjoys an unbroken lineage. From the time of its founding nearly 800 years ago, the school's body of knowledge has remained intact and has expanded with each generation. Its theories and practices draw on Buddhism, Daoism, and 3,600 other schools and philosophies. For centuries its methods were known only to the Emei Linji monks, with the highest and most treasured secrets passed down through the succeeding lineage holders. This secrecy began to change a generation ago, in response to the political turmoil of the mid-20th century. The school's 11th lineage holder decreed that henceforth, the lineage would pass between a monk and a lay person. Opening the practice to lay audiences ensured that the treasured knowledge wouldn't be lost with the destruction of a single monastery. Grandmaster Fu Wei Zhong is the school's 13th lineage holder. He was given two missions: to find and train his successor monk, and to teach Emei Qigong to lay people in both China and the West. Emei is the only major school whose lineage holder is teaching in the West. Grandmaster Fu spent three years in isolation in order to distill the centuries of knowledge into forms that would be effective and could be learned easily by people with relatively little time to practice. He is continuing to refine qigong forms that are appropriate to Western audiences; has written several books for English-speaking seminar participants; and has prepared a multi-level training program to teach basic qigong as well as train those who wish to become Emei Qigong teachers. By attending a four-day Level I seminar, participants learn how to heal themselves and others. Students are taught a gentle qigong form that enables them to generate and store qi. They learn a heart-centered philosophy that lets them clear past and present negative emotions and events. It's impossible to say precisely what each person who attends an Emei Qigong seminar will gain, because no two people experience identical benefits from the practice. But there are elements in common. The overwhelming majority of those who practice what they are taught experience improved health almost immediately. Their senses sharpen, and so does their intuition and subtle awareness. They become calmer and more able to direct their feelings and actions, and this transforms their life path. Tyra Mead has trained extensively in the United States and China with Grandmaster Fu Wei Zhong and teaches Emei Qigong seminars. For more information, email tyra@healthywealthywiseqi.com. Among the many styles of qigong, Zhineng (Tszu-nen) qigong, known as Wisdom Healing® Qigong, is one of the most powerful in the world. Master Mingtong Gu is a Chinese born, internationally recognized teacher and healer. He received his training from a variety of Grandmasters in China, Tibet, and at the world's largest qigong "medicine-less" hospital under the direction of world renowned Dr. Pang Ming. The Zhineng Qigong Center has treated over 200,000 patients in China with over 185 different illnesses--at a 95% success rate. Through gentle movements, visualizations, sounds and conscious intention, Wisdom Healing® Qigong dynamically restores the life energy and creative power within oneself. Master Gu has taught qigong to thousands of people in the United States, China, and Europe. His method combines aspects of traditional qigong with Eastern and Western medicine, forming a concentrated and powerful system of healing on all levels of being. By tapping into this ancient healing technology, practitioners obtain powerful tools for self-healing, strengthen endocrine and immune systems, reduce stress, anxiety and depression, and promote longevity. By achieving a deeper sense of well-being, emotional stability and balance, practitioners are also empowered to attract positive changes into their lives. This practice enhances other mind-body-spiritual practices and deepens the connection to universal healing energy. Research has found qigong initiates the relaxation response, decreasing heart rate and blood pressure. It alters the neurochemistry profile moderating pain, depression and addictive cravings, as well as optimizing immune capability. Qigong also coordinates right/left brain hemisphere dominance promoting deep sleep, reduced anxiety, and mental clarity. In 2008, Master Mingtong Gu and Lingling Gu opened the Wisdom Healing Chi Center in Petaluma, CA. The center offers presentations, healing events, workshops, retreats, instructor training, and group/individual healing sessions. For more information visit www.chicenter.com or call (707) 347-6489.